The kidnapping will be seized upon by Vietnam's human rights critics in Europe who will have their say when debating the important FTA. Foreign investors and world trade institutions have long wished one thing for Vietnam: reform of its inefficient and corrupt state-owned enterprise sector. Competency, transparency and a measure of real competition would aid the nation’s economy and its business and trade relations tremendously. This is one reason why Vietnam’s support for the Trans Pacific Partnership (TPP) was so well thought of. To its credit, Vietnam has made some progress and last year, at the 12th five-yearly National Congress, General Secretary Nguyen Phu Trong underlined the necessity of reform. However, the recent kidnapping of a disgraced former executive who was applying for asylum in Germany has undermined confidence in rule-of-law based reform. On 23 July, former PetroVietnam executive Trinh Xuan Thanh, 51, was apparently kidnapped from Berlin’s large Tiergarten park and spirited back to Hanoi via 'an unnamed Eastern European country'. He has since appeared on Vietnamese TV, saying he travelled by choice. Thanh faces charges of financial management at home - PVN lost $US150 million under his watch - and he had been arrested before escaping to Germany and applying for asylum. His hearing was due just before his kidnapping. There was also an international warrant for his arrest. Vietnam's long struggle with corruption has resulted in other arrests, though rarely anyone as high-level as the Lexus-driving Thanh who holds a ‘Labourers Hero in the Renovation Era’ medal issued in 2011. Many analysts also wonder if the charges against Thanh were part of Trong's efforts to rout out all the allies of his rival and former PM, Nguyen Tan Dung. The expulsion of Thanh ally, Dinh La Thang from the Politburo earlier this year for mismanagement in past roles likely reflects serious commitment to both goals. Corruption in Vietnam is, sadly, an evergreen issue. There are also external developments in play, including negotiations underway for a Free Trade Agreement between Vietnam and the EU. The loss of the TPP has refocused Vietnam on securing more markets to alleviate its massive trade imbalance with China, a goal which may be beyond the reach of the proposed Regional Comprehensive Economic Partnership. For its part, the EU sees a strong market in Vietnam with its growing middle class and its desire for alternatives to Chinese goods, often thought to be of inferior quality. Stumbling blocks include Vietnam's human rights record that has been brought up by various EU members. The ongoing crackdown on bloggers is already likely to come up for debate in the EU Parliament; the kidnapping on German soil will help nothing. Up until now, Germany has been one of Vietnam's best friends in Europe, as well as its biggest trading partner in the EU. 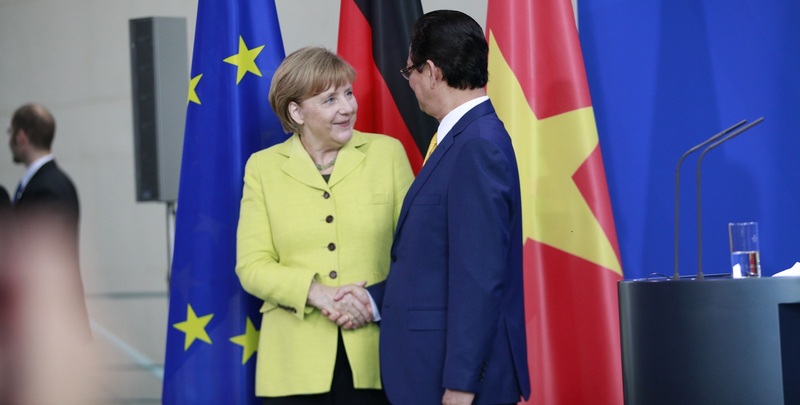 Prime Minister Nguyen Tan Dung and Chancellor Angela Merkel signed a strategic partnership agreement in 2011. Such non-binding partnerships are tailor-made for each bilateral relationship. Security and defence are becoming increasingly central to such relationships for Vietnam. But what is the centrepiece of the German-Vienam agreement? Outside of education and environment, there is rule of law, German efforts to assist in reforming Vietnam’s legal system and, according to German Foreign Ministry, 'advice on implementing international conventions and regulations ... promoting human rights and legal aid as well as other issues'. This does not square well with the Foreign Ministry statement on the kidnapping: 'The abduction of Vietnamese citizen Trinh Xuan Thanh on German territory is an unprecedented and blatant violation of German and international law'. The issue here is a broader one. Vietnam wants to be part of the international community. It values multilateralism and the rules-based agendas of democratic nations like the US and Japan. This is largely due to Vietnam's disputes in the South China Sea over China’s nine-dash line. Vietnam supported the Philippines arbitration with China at the Hague and wants to see international law put to use in its maritime disputes. Before heading to Washington earlier this year, PM Nguyen Xuan Phuc gave a TV interview saying he would be reiterating the United Nations Convention on the Law of the Sea to President Trump. Similarly, Vietnam has long pushed for a written Code of Conduct relating to these issues, trying again at the ASEAN meeting this week. To help advance such interests, Vietnam has been looking for a stronger international role for some time, from a non-permanent chair on the UNSC to peacekeeping and a seat on the UNHRC a few years ago. In this context, the Cold War-style kidnapping is considerably jarring. It has disrupted German legal process, violated international law, and does not fit with responsible nation status. Domestic politics matter mightily to the Communist Party of Vietnam, but if Thanh is guilty, Germany would surely have allowed Vietnam to have him back, unless he was to face the death sentence (possible). As it is, the kidnapping will be seized upon by Vietnam's human rights critics in Europe who will have their say when debating the important FTA. Three years after the military coup, the trial of Yingluck rehashes old grievances and threatens to unsettle the relative calm. The far-north will be key to closer cross-border ties and Cairns hosted the Australia-PNG Emerging Leadership Dialogue.